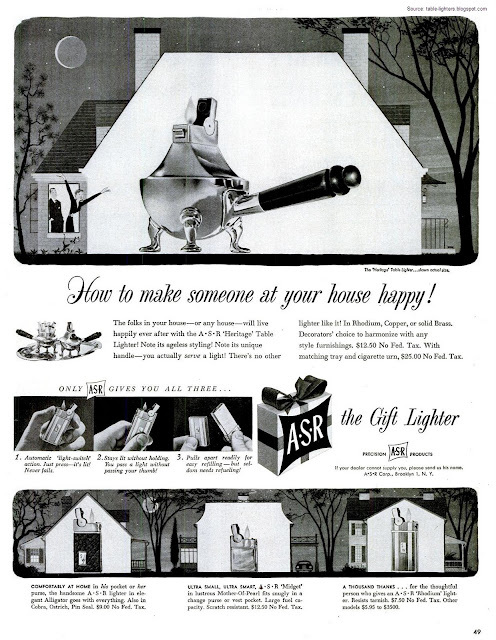 This A·S·R· magazine advertisement was published in LIFE, on the 27th March 1950 and it depicts among others the Ascot Heritage Set finished in rhodium made by A·S·R· Corp.
Ganci Argenterie S.R.L. – Italian Silversmith, the company was founded in 1920 in Milan [VIA ALTAGUARDIA 11 - MILANO (MI) - 20135] and is still in business. This company made the lighter base. 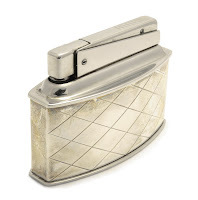 This KW wick table lighter model 676 was first manufactured by Karl Wieden (KW) in 1938 in Solingen-Ohligs, Germany. The production ceased probably in the late 1950s. 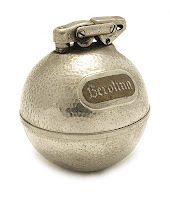 It is a light round figural lighter in the shape of a golf ball or a hand grenade. It was often used as a advertisement medium. 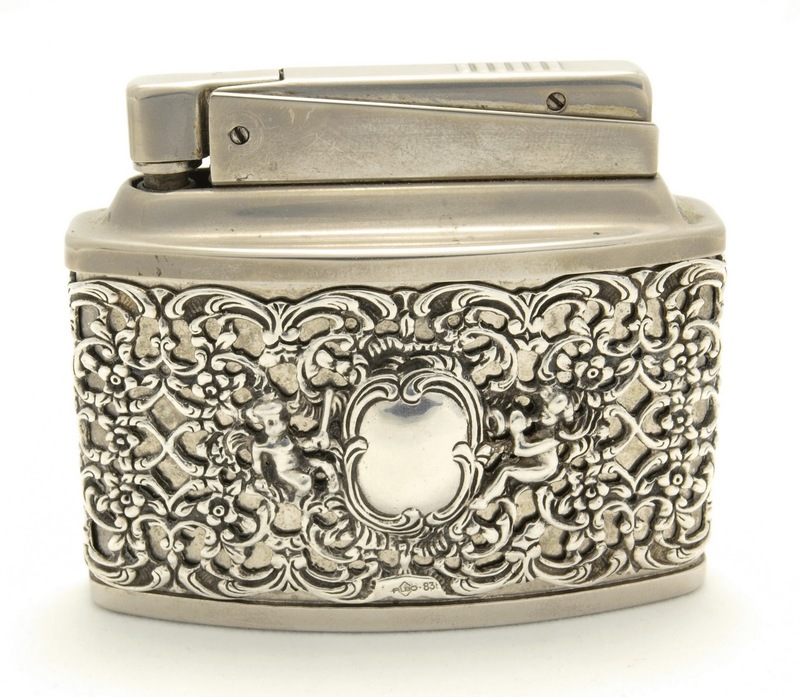 This Capri wick table lighter was first manufactured by Karl Wieden (KW) in 1951 in Germany. The production ceased in the 1957. Later in 1958 it was replaced by the KW Capri gas lighter. 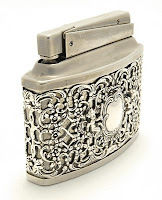 This automatic table lighter was available in different finishes: silver, nickel plated, leather covered, enamelled etc. The picture on the right shows a KW Capri made of German silver (nickel plate) in a silver sterling (.925) mantel. The base is not weighted. Marked on the side: 925 and on the bottom of the base: KW capri. The removable lighter insert is a standard nickel plate KW Capri – a very efficient and durable mechanism. This smoking set was crafted in cooperation by Ronson and Rosenthal GmbH between 1971 and 1973 in West Germany. Ronson made the lighter insert and Rosenthal the porcelain base. Rosenthal is a famous German porcelain manufacturer. The company was established by Philipp Rosenthal in 1879 (now part of Sambonet Paderno). The products were first marked with the company name in 1907. Rosenthal produced many innovative designs under its higher end "Studio Linie" brand. The painting on the base was made by Bjørn Wiinblad (1918–2006) a Danish painter, designer and artist in ceramics, silver, bronze, textiles, and graphics. His work has been shown widely all over the world. Wiinblad was an important designer for the Rosenthal porcelain company since 1957 till his death in 2006. Wiinblad designed ceramic pieces for Nymolle, a Danish pottery and of course cooperated with the Ronson Company. At least nine different models of table lighters are known that were signed by Bjørn Wiinblad. Wiinblad was named Man of the Year in New York in 1985 and was awarded the American-Scandinavian Foundation’s Cultural Prize of 1995. The table lighter uses the Ronson round Varaflame gas fitment. It is chromme plated. Different finishes of the finger flame control are known. One of them is the blue Swarovski crystal - see picture. This wick table lighter was made in 1954 and 1955 in England by Ronson and Wedgwood. Wedgwood is a British pottery firm, founded on May 1, 1759 by Josiah Wedgwood (1730–95). The company still exists and is noted for its numerous innovations and high-quality wares that achieved renown throughout the world. Wedgwood's name is synonymous with the Jasper Ware body type. The Ronson Wedgwood Imperial was available both in silver-plated (see picture) and goldplated fitment which was based on a face-lifted Ronson Rondelight. 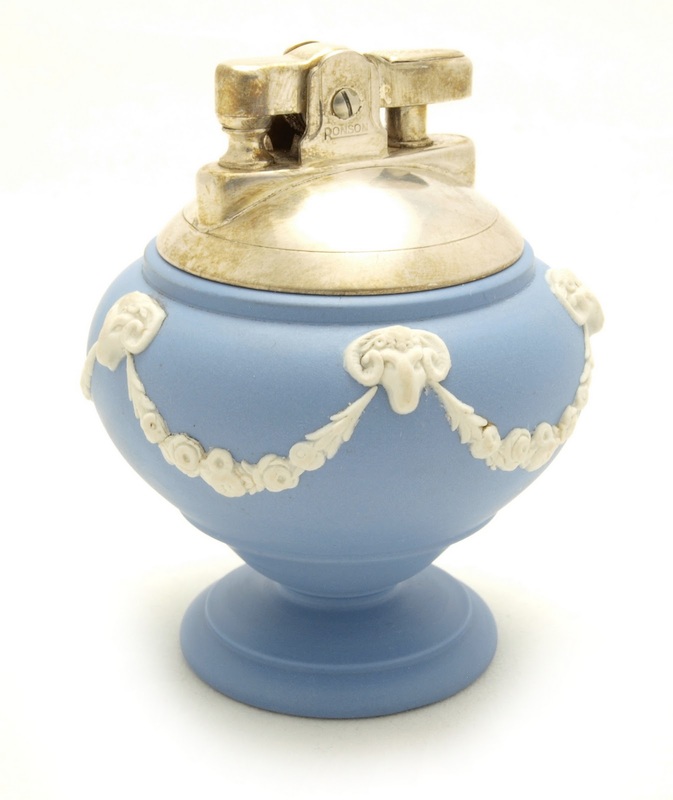 The lighter insert is mounted in Blue Jasper base made by Wedgwood with overlaid design – heads of aries (rams) holding strings of flowers – in white ceramic. The lighter base is padded with beige felt. The Ronson Imperial was also sold with a matching ashtray. 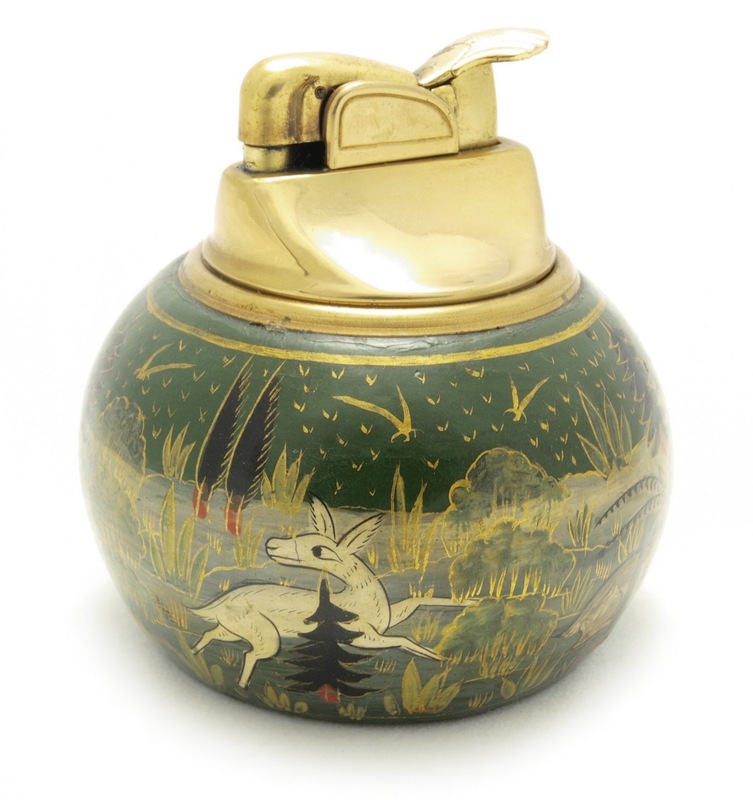 This extraordinary table lighter was made by Evans Case Company and by an unknown artist in 1959. 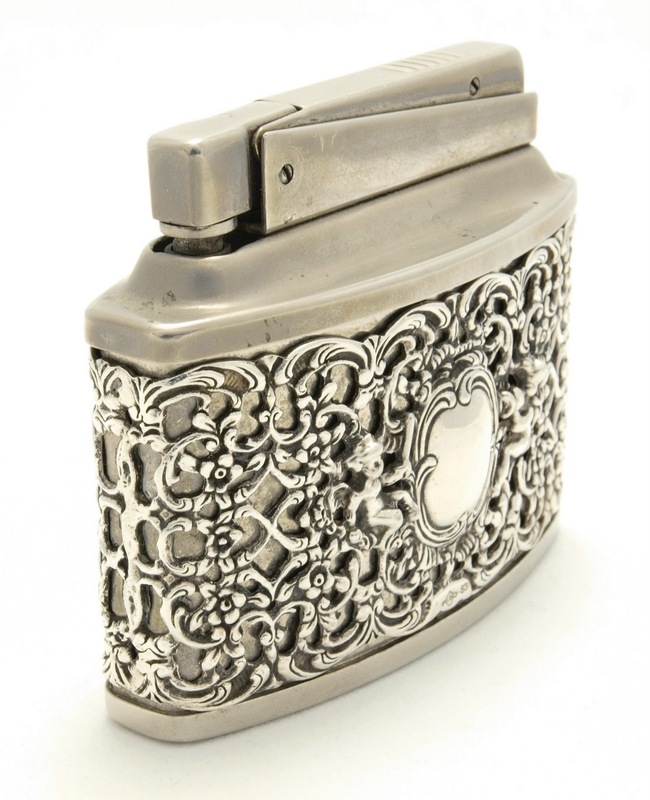 The base of the lighter was hand made in Kashmir, India and the lighter insert by Evans in their plant in North Attleboro, Massachusetts, USA. This Ronson magazine advertisement was published in Life on the 8th November 1954. 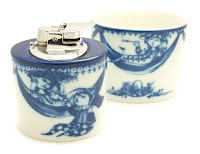 It depicts two cigarette table lighters made in cooperation by Ronson (lighter insert Essex) and Rosenthal (porcelain base). Both lighters were designed by Harold Sitterle (born in 1921) and are rare. 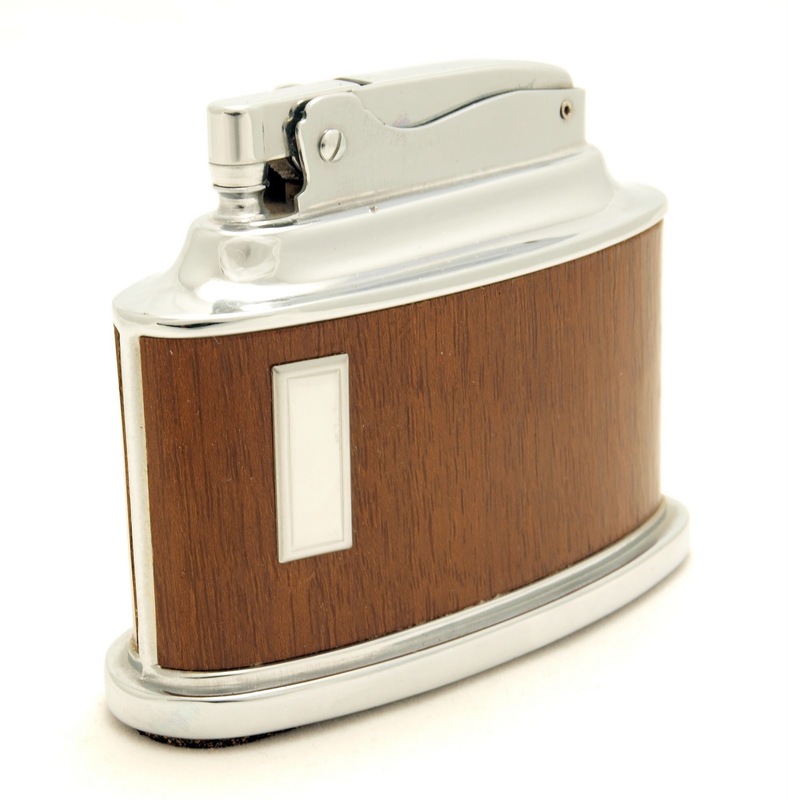 This table lighter was made by Albert Bodemer Silberwarenfabrik GmbH (known as ALBO or AB) in cooperation with KW between 1953 and 1959 in Germany. The Albert Bodemer Silberwarenfabrik GmbH was a typical hollowware manufacturer established in the 1940's in Keltern-Ellmendingen, Germany. It is still active today and run by the daughter of Albert Bodemer who invented all the patterns and forms. The lighter inserts were provided by several German lighter manufacturers, like KW or Augusta Zünder – today only the BIC company is their supplier (butane lighters). The rounded openwork has a floral design accompanied by two angels and a field for a monogram in the middle. The openwork was made of silver in different purities: 800, 835 and 925 grade of silver. Marked on the side: ALBO. Marked on the bottom of the base: KW Classic. 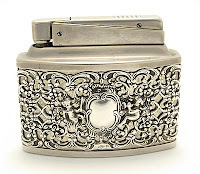 The lighter insert was provided by KW (Karl Wieden) a known German lighter manufacturer who produced lighter since 1905 till 1980 in Solingen Ohligs, Germany. It is made of brass and is nickel plated. The lighter insert model is KW Classic and it is based on the Theodor Ruetz system patent. 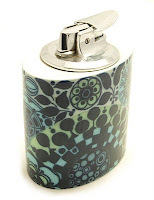 The picture above presents a petrol (wick) lighter. A butane gas lighter in the same shape was introduced in the early 1960s. 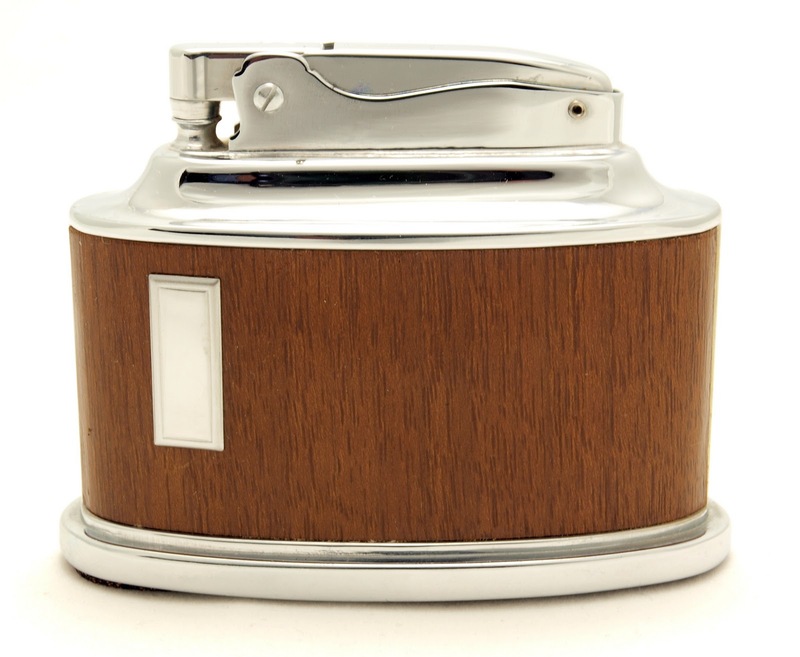 The Ronson Trophy Table Lighter was first manufactured in 1950 both in Newark, New Jersey, USA and in London, England. 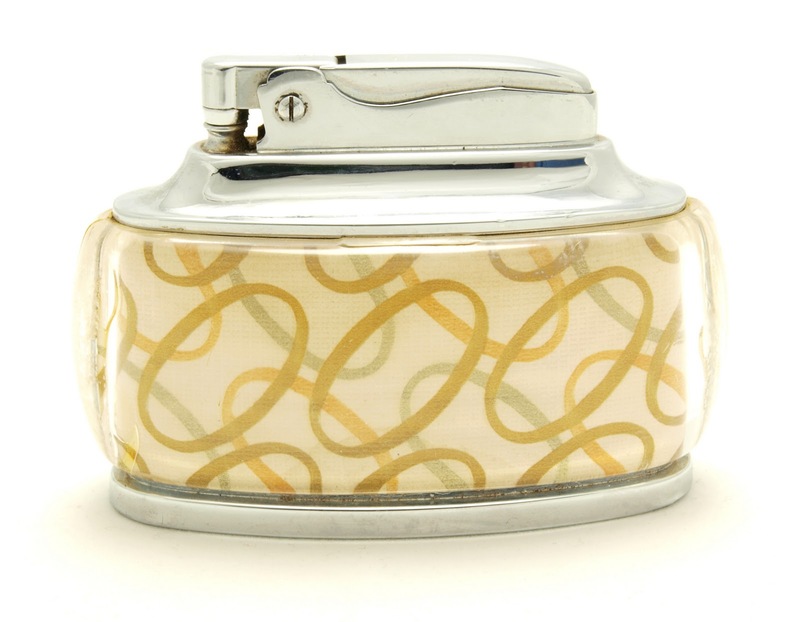 It is a solid oval-shaped petrol (wick) lighter with an interesting range of motifs covered with a thick transparent plastic. The Ronson Trophy was manufactured probably until the year 1957. This wick lighter was also available as an advertising medium. Known advertisers: Nash Honor Club, '57 Ford Ranchero, Martin Aircraft, Four Rouses Whiskey, Frankfort Distillers Corp, Early Times and Old Forester Whiskey which are rare. The base is padded with green thick felt and cork. 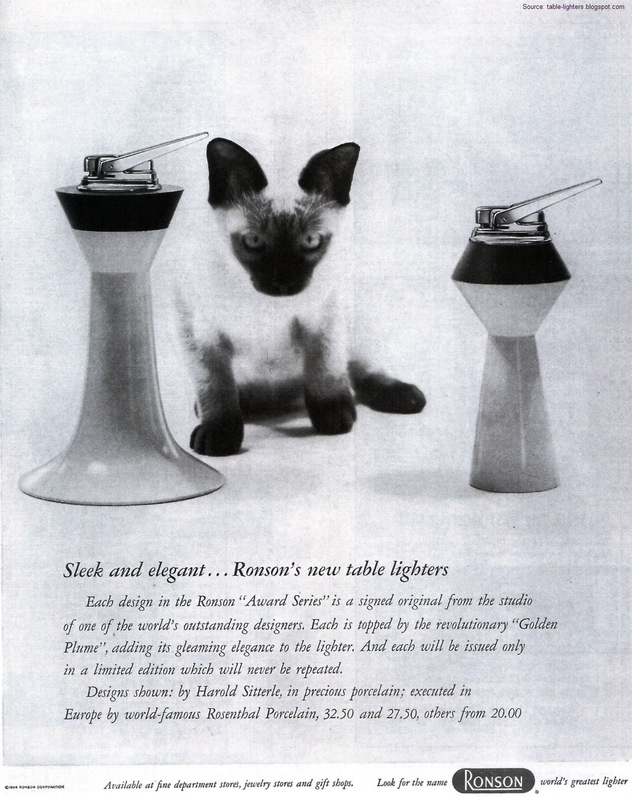 Ronson manufactured another table lighter on the same name in the 1970s in England: Ronson Varaflame Trophy. 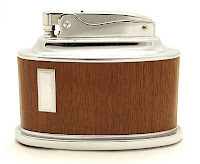 The base was made of wood and the lighter insert was a typical gas Ronson Varaflame. 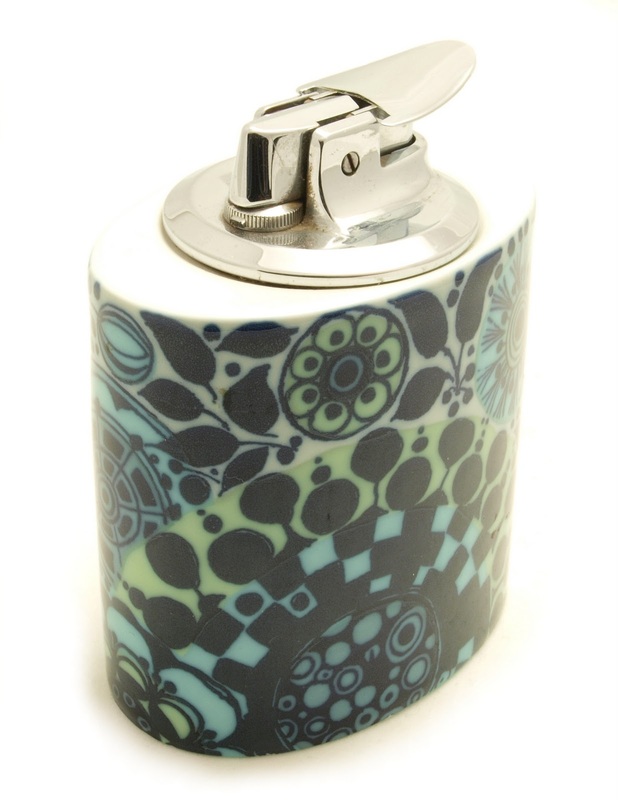 Ronson Senator Desk/Table lighter was first manufactured in 1950 both in Newark, New Jersey, USA and in London, England. 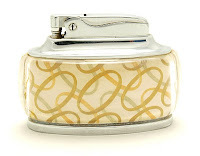 It is a solid oval-shaped petrol (wick) lighter with an interesting range of leather and wood veneer finishes. The Ronson Senator was manufactured probably until the year 1954. 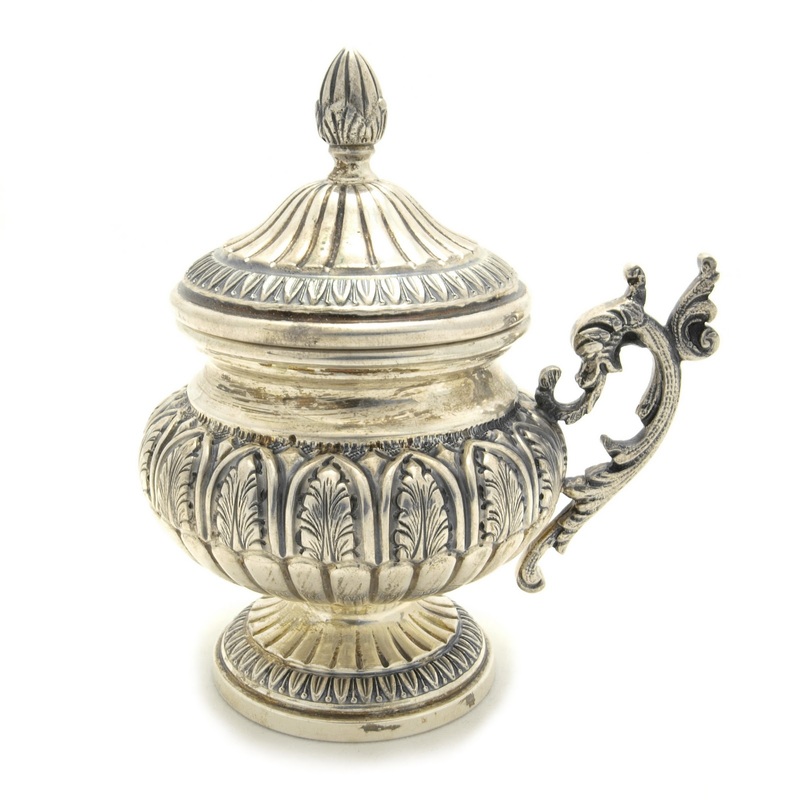 In the UK the Senator was also available in sterling silver - rose motive on the side - which is very rare. 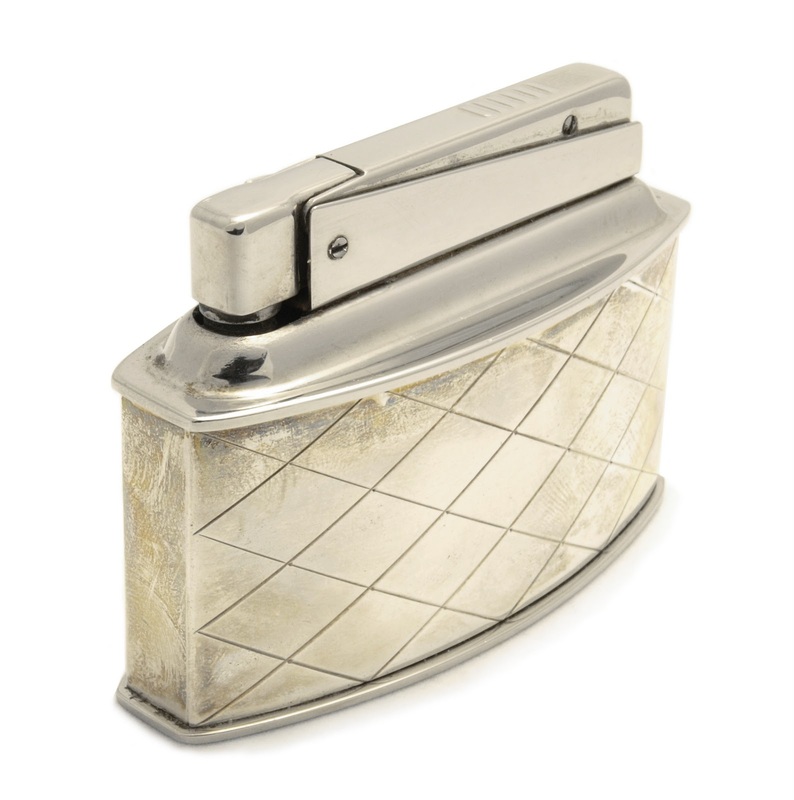 This handsomely designed brass chromium plated (also seen gold-tone plated which is rare) desk lighter was based on the Adonis lighter fitment. Primely available in genuine pigskin and a more expensive alligator-lizard finish. A year later genuine mahogany wood veneer (see pictures) finish was introduced. In 1952 the Senator family expanded by two other wood veneer: walnut and bright wood. The British version does vary a little bit from the one manufactured in the U.S. In case of the Ronson Senator made in England the base is padded with green thick felt versus made of cork. Also the size of the monogram shield is different - the English one is wider but lower than the American one. The English Adonis fitment is also marked Ronson. Worth to mention is that a Senator without a monogram shield is rare.